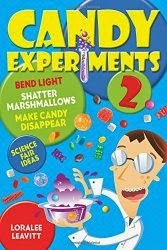 At school a few days ago, one of my daughter's friend had an announcement for me: "I did my own candy experiment!" Apparently he dissolved a lollipop. Glad I had some expertise in this area, I asked him if the lollipop stick unrolled. He wasn't sure. More research coming up!